A new...less expensive...take on soil testing. A new…less expensive…take on soil testing. Fifty cents per soil test sounds crazy, right? It’s not and may soon be reality for farmers the world over. “It’s a simplistic idea for soil analysis that could have a huge impact for the world,” says Eylül Kaya, Montana State University plant pathology master’s student, as she meticulously adheres barley seeds one by one to a strip of biodegradeable paper. These seed-dotted strips are the tests. Just plant them in a field and in 10 to 20 days they’ll reveal what nutrients are deficient for a fraction of a fraction of the cost of traditional soil testing. If plants grow strong and healthy, nutrients aren’t a limiting factor for production. If plants sprout but yellow, wilt, or die, something’s amiss. These indicator seeds are the result of identifying and breeding mutant barley plants. Each carefully selected plant isn’t very good at pulling specific nutrients from the soil. If there’s plenty of the nutrient, it will do fine. But, if a nutrient is in short supply, the plant struggles more than its peers. Basic elements. Each seed strip tests for an individual nutrient. Of fourteen key nutrients needed for plant growth, the MSU team has isolated barley mutants to evaluate nine: nitrogen, phosphorus, sulfur, calcium, zinc, boron, selenium, copper and molybdenum. They’re still working on indicators for potassium, magnesium, iron, cobalt and manganese. Cost is far from the only perk. These tests show plant-available nutrients in the soil. Traditional chemical soil analysis may reveal how much of a nutrient is in the soil, but not if it’s truly available to the growing crop due to form or soil pH. This is a piece of the puzzle farmers who focus on soil health have long sought. 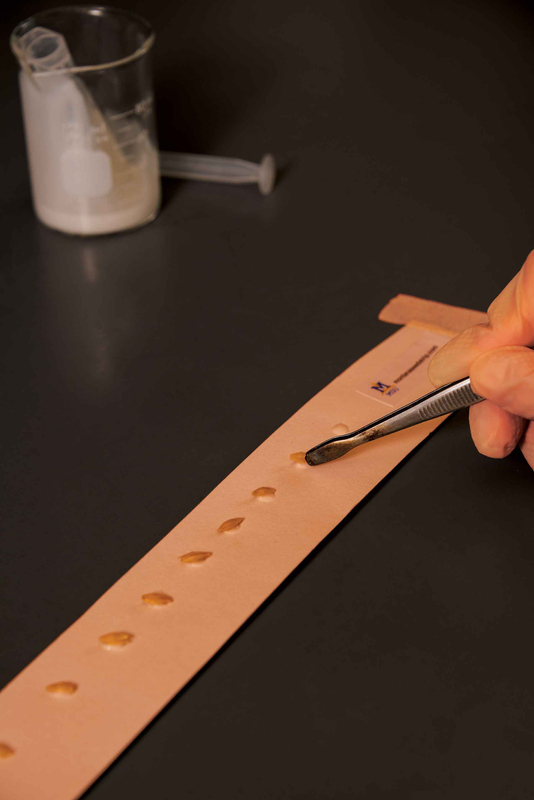 Primed barley seeds are glued to a biodegradeable strip of paper before being planted in a field to identify bio-unavailable soil nutrients. The idea for this project took root more than four decades ago. An MSU barley breeder, Robert Eslick, noted one of his barley varieties turned a bright reddish purple. He attributed the hue to poor genetics for phosphate uptake, explains David Sands, professor of plant pathology at MSU and the seed strip project leader. “Barley is perfect for this project. It’s a diploid organism, which means it has fewer chromosomes (two) than say, wheat, which is hexaploid (six). It’s impossible for the mutants to hide behind other genetics once they’re bred to be stable,” he says. Barley also germinates and is grown on every continent short of Antarctica. Collecting mutants. Sands spent years convincing Australian barley breeder, Peter Langridge, to send him his collection of 4,000 pairs of mutant barley seeds. The team seeded the trove, staking out plants that germinated then started to struggle. They applied Miracle-Gro so the plants would have all needed nutrients. Plants that rebounded were saved. In the next stage they discovered a plant may be an indicator for more than one nutrient, which is a problem. Their fix was to prime the seeds. “We soak them in a solution that includes all nutrients except the nutrient we are evaluating,” Kaya explains. Seedlings have everything they need to be successful unless the soil is deficient in the nutrient not supplied. Global thinking. Seed Sentinel strips, as they’ve been dubbed, move from greenhouse trials to the field in 2016. For first-world farmers this test may serve to cue them into the biological workings of their soils or maybe increase the frequency and intensity of their existing soil testing program. For the massive population of subsistence farmers around the world, though, this may bring soil testing to them for the very first time. The role livestock can play in improving soil health.